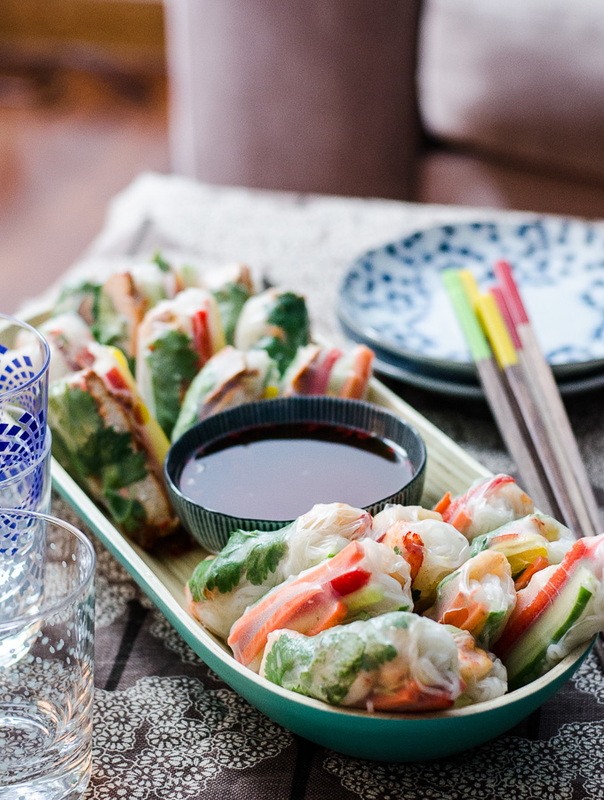 Is there is anything as delicious and versatile as a rice paper roll? It’s pretty much salad in convenient, bite-sized, edible packaging. I wish I could tell you that I fell in love with these while travelling but the truth is that I ate my first one at a different sort of a Vietnam, Melbourne’s Victoria Street – home to some of the city’s best cheap eats. If I was being completely honest, I actually like our Australian-ised version of these better because the quality of our meat and seafood is just so good. And don’t just take my word for it, this is sanctioned by the queen of rice paper rolls herself, who makes the point – Australians don’t eat tendons and gristle like Asians do. It has recently been brought to my attention that what I describe as super easy is apparently not actually super easy to others. While I cook chorizo pasta for lazy dinners, other people tell me that their lazy dinners are toast. But I promise these are easy, cross my heart! You’ll find these in most Asian grocery stores – they’re usually round, semi-transparent and the main ingredient should be rice or rice flour. The Vietnamese have a dozen different types of rice paper, some are eaten dry (they soften slightly after being dipping in sauce), some are fried and some are used to make these soft ‘summer’ rolls. If in doubt, ask the nice (sometimes grumpy) aunty lady at the front counter. If in doubt, buy a few and try them out – they’re usually pretty cheap and keep for years. I use the smaller ones for snacks and canapes and the larger ones for lunches and dinners. I never use vermicelli in my rice paper rolls – though that’s not to say it can’t be done. The regular rice vermicelli is too thin and lacks that delicious chewy texture that authentic rice paper rolls have. Look for rice sticks at the Asian grocer instead – they should be round, like vermicelli, but thicker. These need to be cooked briefly before using. Check the package instructions for details. I don’t actually know what they’re called but they’re around $10 for 10. I haven’t seen them on any blogs or websites, so I wouldn’t have even known about this secret until a Vietnamese friends mum put me onto them. Maybe just show the aunty at the store the picture below. With these, you can dip each paper into warm water for a few seconds, then place it on the mat. Repeat with the other nine mats then come back to the first one for perfectly textured rice paper to make rolls. Warm water gives you a bigger margin of error to work within. Cold can take too long to rehydrate and hot can make the paper disintegrate. I like to use water that is just warm to the touch. Just as the dipping sauce is a balance of salty-sour-sweet, the filling should also be balanced. It should be crunchy and chewy; herby and fresh. I always use one protein (thin slices of omelette, sashimi fish, prawns or chicken), a few vegetables, two herbs and rice noodles. Shiso (also called perilla) and vietnamese mint are my favourites, but impossible to get in Sri Lanka, so I’ve used coriander and mint. For more tips on balance, see this article. Ms Chu also recommends not storing these rolls in the fridge, but you know – when needs must. Avoid it where possible, but sometimes it’s just too hot and other times you just don’t have time to make everything before serving. Do what needs to be done. Cook the rice stick by bring a small pot of water to boil. Add rice noodles and stir to separate; cook until barely tender to bite, 2-5 mins according to packet instructions. Drain. If not using immediately, rinse in cold water to keep noodles from sticking together, and drain again. If you are using vermicelli, you do not need to cook it, just rehydrate in water for approximately 15 minutes, then drain. Cook the chicken breast by pan frying, then slice into thin slices. Assemble the rolls (pictured above). Combine all ingredients except lime juice in a small saucepan and heat until sugar is dissolved. Add the lime juice, then taste for balance of salty-sour-sweet. Add more fish sauce, vinegar, lime juice or sugar as necessary.